While blood and marrow transplants can save the life of a pediatric cancer patient, research out of the UAB found that those patients may be at an increased risk of premature death years or even decades after the procedure as compared with the general population. 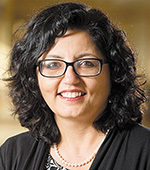 Smita Bhatia, MD, MPH, professor of pediatric oncology at UAB, served as the senior author of findings from an observational study in the Journal of the American Medical Association Oncology. The study analyzed data regarding cause of death for nearly 1,400 patients who lived two years or more after undergoing an allogenic blood or marrow transplant in their childhood between the years of 1974 and 2010. Leading causes of death in the patient cohort were infection and chronic graft-vs-host disease, patients' primary disease, and subsequent cancers. The data also indicated that the rate of later death among these transplant patients has decreased over the last three decades. The authors say it is promising to know that mortality rates have dropped, and the research gives more insight as to what causes late mortality in this population, and how to help other patients moving forward. "This study shows that, while we are able to save the life of the child during their cancer treatment, we need to continue to provide proactive follow-up care with these types of patients throughout the rest of their life, as they are still an at-risk population," Bhatia said. "The high intensity of therapeutic exposures at a young age lends itself to cause morbidities and organ compromise once they reach adulthood."